TAMPA, Fla. – No. 5 Florida dispatched No. 19 Michigan and No. 7 Arizona Saturday afternoon to stay undefeated at the USF Opening Weekend Invitational. 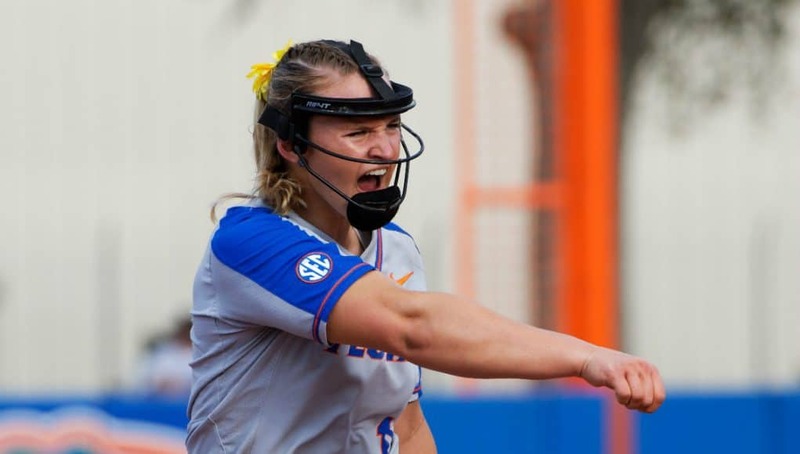 Senior hurler Kelly Barnhill (2-0) picked up the complete-game victory over the Wolverines (1-2) and secured her fourth career save, first of the season, when she stifled the Wildcats (2-1) rally in the final inning of game two. Offensively, the wealth was spread pretty evenly across the lineup with senior Amanda Lorenz and Kendyl Lindaman leading the way going 3-for-7 at the plate. However, a pair of home runs from junior Jordan Roberts and sophomore Danielle Romanelloproved to be the difference in the win against Arizona. 2nd 1-0 Hannah Sipos notched her first career RBI with a shallow single to center field that scored pinch runner Jade Caraway. 7th 4-0 Jaimie Hoover doubled to center field which scored Lorenz and Sampson. She then advanced to third on the throw home. 7th 5-0 Hoover raced home and scored after Roberts ripped a ground ball to third. Roberts reached base thanks to a throwing error. 7th 6-0 Hannah Sipos concluded the scoring with a SAC fly to center field that scored pinch runner Amanda Beane. 1st 2-0 Romanello cranked her first home run of the year after she lifted a 1-2 pitch over the right field wall. Lindaman scored on the play after reaching via a fielder’s choice. 2nd 2-1 The Wildcats closed down the Florida lead in the next frame with a leadoff solo home run by Dejah Mulipola. 2nd 3-1 Roberts extended the Gators lead back out to two runs when she smacked a solo home run to right center field. 6th 3-2 Malia Martinez attempted to rally the Wildcats offense with a solo home run to left field. 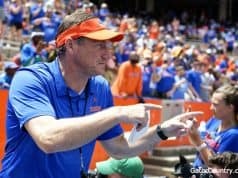 Florida head coach Tim Walton improved to 12-2 overall against Michigan’s Carol Hutchins and 5-0 against Arizona’s Mike Candrea after today’s sweep. Walton improved to 848-213 as a head coach and currently leads all active NCAA DI coaches with a .799 win percentage. Hutchins (1,572-506-1) and Candrea (1,565-405-2) are both legends in the sport and have combined for over 3,137 victories with win percentages of (.756) and (.793) respectively. 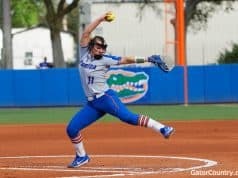 The program improved to 308-233 against teams ranked in the USA Today/NFCA Coaches Poll and 265-144 against teams in the ESPN.com/USA Softball Poll. 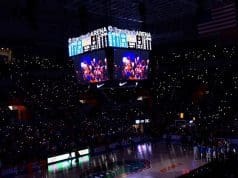 This is the sixth consecutive season that UF has opened its year at a tournament held by USF; over that span the Gators hold a 26-0 record. The Gators return to action Sunday to take on N.C. State at 1:30 p.m. and host USF at 4:15 p.m.